Jocelyn Black Hodes of Marketwatch.com lists 10 ways where the behavior of wealthy individuals differ from most. When looking at these methods, they are something that we can all do. It just takes discipline, focus, and perseverance. Step 1: Start early. While it is ideal to start early in life, you can start at any time. The quicker you begin the process, the better off you will be at retirement. Step 2: Automate. Go to your financial institution and ensure that a specific portion of your check (ideally 10 percent or more) goes to savings. First, build up your emergency savings where you have a minimum of one monthly paycheck, if not two or three months. Then, it is recommended that you align yourself with a certified financial planner and direct a portion of your future savings toward prudent investment products based on your financial goals. Step 3: Maximize your contributions. Seek your benefits specialist at your job to determine whether your employer makes any contributions. If so, you will want to deduct from your check whatever they are willing to match, which could be up to 5 percent. Step 4: Never carry credit card balances. This means an end to impulse buying. When going to the mall or an electronics store, never buy an item that you initially like. Instead, make a mental note of it, then go back and plan within your budget whether it can be reasonably purchased at a later date. If you carry a credit card debt and you have established an emergency savings fund, then redirect your savings to draw down your credit card debt. Make sure to focus on eliminating balances with the highest interest rate, rather than the lowest balance. Step 5: Live like you’re poor. Rather than ‘live within your means’, make sure to live BENEATH your means. Keep your eyes on the prize and keep a visual image of your financial goals where you are constantly reminded of what you are hoping to accomplish. Step 6: Avoid temptation. The worst thing to do is try and emulate your neighbors. Resist trying to match their car, high-definition TV, or immaculate wardrobe. Recognize that it is where you end up and not where you start. You do not want to reach retirement age with the realization that you must continue working. Instead, think about how thankful you will be about the sacrifices you made early in life, so that you can live comfortably in your twilight years. Step 7: Be goal-oriented. Rather than think paycheck to paycheck, think year to year and even decade to decade. If you are single and just started working, then you should be thinking about saving for a home. If you have young kids, realize that college tuition continues to rise, so set up goals for establishing a college savings fund. Otherwise, your financial goals should center on retirement and not worrying about the daily necessities of life. Step 8: Get educated. We need to stop making excuses about not understanding money. Check out MyMoney.gov which was created by Congress and the Federal Financial Literacy and Education Commission. Learn the basics and then regularly read news from the web, such as Marketwatch, CNNMoney, and Yahoo Finance. Step 9: Diversify your portfolio. When developing your investment portfolio, emphasize time horizon and risk allocation. Regardless of your age, you need to choose investment products based on the timing of your investment goals. If your goal must be met within five years, then choose more bonds and money market accounts where they will have a lower return, but less risk. If your goal reaches beyond ten years, then choose more stocks where the return is higher, but also the risk. With stocks, make sure that you also diversify within industry because some do well even when the economy is tanking, such as consumer staples, such as Family Dollar, Walmart, and Proctor and Gamble. Step 10: Spend money to make money. As you accumulate more wealth, it is wise to start hiring professionals with expertise in investment and tax planning. They will provide you an edge in getting the most bang from your buck. Rather than allow circumstances dictate your ability to generate wealth, take control of your finances by being disciplined in money matters. ABCya! Learn to Count Money – Recommended for Grades 3-5 from ABCya website. Teaches you how to count coins. Tests your motor skills while learning how to distinguish between coin values. Improves memory skills through using basic money terms. Mad Money – Recommended for Grades 3-5 from PBS Kids website. Dollar Dive – Recommended for Grades 3-6 from USMint Kids website. Helps motor skills while learning to distinguish between coin values. Coin-doku – Recommended for Grades 7-12 from USMint Kids website. Similar to Sudoku, but uses coins rather than numbers. 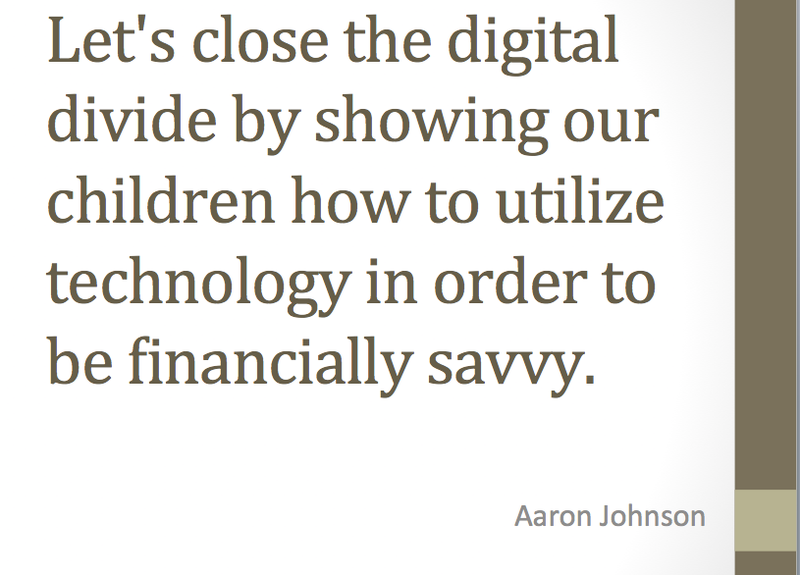 Let’s close the digital divide by showing our children how to utilize technology in order to be financially savvy. Showing children the value of money must start at an early age because habits are hard to break. Might as well make those habits good ones. Alicia Munnell of MarketWatch reports on a disturbing trend of young adults and investing. The combination of slow wage growth and rising tuition are convalescing together to make it difficult to save. This will have implications into the future because saving early in the life cycle will pay big dividends when they retire due to the power of compound interest. Over 2/3 of the 2011 graduating class will have some form of student loan debt. The average amount of debt was $26,600. These numbers are probably understated because the survey excluded more expensive for-profit colleges, whose respondents did not participate. First, if you are about to attend college, do not fall into the same trap. Make sure to manage the student loan process effectively. If you have exhausted all other sources of funding, including personal and family support, scholarship money, and grants, then student loans can be a viable option. In this case, it is recommended that you examine federal loans first and only rely on private student loans as a last resort. Check out the Consumer Financial Protection Bureau, which offers helpful information on all types of student loans. Federal student loans offer lower rates and more flexible repayment options because these programs are subsidized by the government. The most popular option are Stafford Loans, which offer fixed-rate loans at relatively low cost, and are available to all students. They are available for both undergraduate and graduate students. If you can demonstrate financial need, then the Federal Perkins Loan Program is a viable option that offers more generous repayment options than Stafford Loans. With both loan programs, the most you can borrow is $5,500. If you have exhausted all of the federal loan programs and still are falling short, then carefully investigate options for private lenders. When assessing private sources, recognize that most of them offer variable rates, which means that changes in the market can result in interest rate rising in the future. There have been instances where rates have gone up to 16%, which is extremely high. Generally, they also offer less flexibility in repayment options. Live like a college student, which means buy as little as possible. Don’t abuse credit and only use it in emergencies. Get in the habit of saving, even if it is as small as $10 a week. Keep it safe by tracking receipts and storing important financial statements in a secured place. Avoid impulse buying and focus only on meeting your needs. Improve your credit score by making timely payments. Be a cheapskate and take advantage of free food from student activities. Utilize your student status around town where you can receive discounted prices on items. Consider taking a part-time job for extra cash, but only if you can manage it academically. Never buy textbooks new and be proactive in getting used textbooks online. Even though the job prospects for a college graduate is much higher than a high school graduate, be cautious about loading yourself down with excessive debt early in their life. Be aware that student loan debt now exceeds credit card debt. Learn from the mistakes of current college graduates by adjusting your expectations. This might mean delaying leaving your parents’ home. It might involve delaying purchasing a house and restraining your spending habits. By doing this, you will pay off your debt quicker and build up your savings. 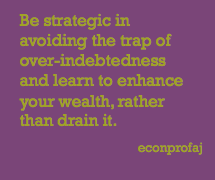 Be strategic in avoiding the trap of over-indebtedness and learn to enhance your wealth, rather than drain it. Find out of your spouse has previously underreported their federal income taxes. If so, you could be liable and it would be better to file jointly. Remember that this tax liability could still stick to you even if after a divorce. If both of you earn similar, healthy incomes, then you might be faced with a marriage penalty. Bischoff’s example was a couple who each earned $85,000 in taxable income. By filing jointly, they would be taxed at the 28% income tax rate bracket, but individually be taxed at the 25% income tax rate bracket. That would come out to a tax penalty of $708, but that could be negated by tax credits earned by being married. When looking at filing jointly, there are many benefits that you could potentially enjoy. This includes the child care and higher education tax credits that you could be eligible for. It is also simpler where you only have to file once and do not need to distinguish what tax credits, deductions, and income that you would be eligible for individually. An additional bonus would occur if both of you own a home. By selling one of the homes at a profit, you would be eligible for writing off that gain up to $250,000 on your taxes. That would lower your tax liability. Before you tie the knot, loosen your tax liability through using these helpful tips. In order to keep abreast of economic news, please consider subscribing to my free online newspaper at econprofaj. While that sounds odd, here’s the reason why. When a family purchases a home, that makes them less mobile. When stuck with large mortgage, it’s not easy to leave town for brighter prospects elsewhere. Therefore if you are living in an area where job prospects are not bright, then it might be harder to move to an area with better job opportunities. Do you live in a seller or buyer market? Are your current job skills a match with the local labor market? For question 1, if you live in seller’s market, then it will be relatively easy to sell your home at a higher price than you paid for it. Assuming that you have enough equity in your home, then your labor mobility is good because you probably will have enough money to cover your mortgage with enough resources to finance moving expenses. Go ahead and buy a home in that area. If you live in a buyer’s market, then that means you are likely going to sell your house at a lower price than you bought it. In that case, your labor mobility is poor and it will be difficult to move without significantly hurting your finances. Be cautious about buying a home and continue renting. You might want to research other more favorable markets to move to. Consider this an opportunity to increase your savings, so that you can put down a larger down payment. For question 2, if you were to lose your job tomorrow, how confident are you that you will find another job with similar pay in a reasonable amount of time? If you believe that you can find another good job quick, then it’s time to contact your local realtor and search for that new home. On the other hand, if you feel very vulnerable and believe that you will have to take a significant cut in pay, then it’s time to reassess. The best time to look for another job is when you have a job. Spruce up your resume and do your research. Is there another part of the country where your skills are better appreciated? Consider reading the Bureau of Labor Statistics’ Occupational Outlook Handbook as a guide to whether your current occupation is in high demand. Then network and find where there is great demand and consider moving there. As a potential investor, learn inside tips on movements of economic indicators that can affect the value of your investment portfolio. As an top-flight business executive, you must keep abreast of key economic indicators that can influence your pricing decision and overall bottom-line. If you are interested in reading about fascinating stories that show how economics and politics are intertwined, then this is a must read. If you are a high school or college student that would like to improve your grade in class, then this site will help you understand how economics is embedded in so many aspects of everyday life. Click on the hyperlink on the first line labeled “econprofaj” where it will send you to the front page. Then on the upper right-hand corner, you should see “Subscribe” in an orange rectangle and then you will get daily updates to my page. Best of all, it is FREE to subscribe! For many Americans, the last few years have been a challenge. You might still be unemployed or just starting to get back to work after a long period of joblessness. Or maybe you put yourself in financial turmoil by using the credit card too much and wiped out your savings. Even if you have a good job, you might be overburdened with student loan debt and it is preventing you from getting ahead. Regardless of the barriers that you have faced, recognize through proper planning and discipline that you can get back on track to the road to prosperity. Obviously, one needs to earn steady income to be financially stable. Therefore, it is imperative that you find employment that best matches your skill set. If you have been out of work for awhile, then your ‘new job’ will be looking for a job. Rather than just filling out applications over the internet, broaden your job search through expanding your network. This means reaching out to friends and family about the type of job that you are looking for. It also means putting through the legwork in getting your name and credentials through various avenues, including civic organizations and local establishments to put a ‘face’ to a resume. Utilize your state and local Department of Labor resources to enhance your job marketability. They offer career assessment and job seeking tips that can be helpful in improving your job search. You might want to consider volunteer opportunities in your career field where you can show off your skills. Even though it is unpaid, this is an opportunity to find your niche and connect with people that can guide you on a more lucrative career path. Also, it will prevent your skills from declining through rust. After finding a stable source of income, you can now plan for financial prosperity. That entails developing a list of financial goals and devising methods to meet those goals. Regardless of circumstances, it is imperative that you take action as soon as possible. Realize that success or lack of success will bear consequences for not only yourself, but future generations. Adjust your lifestyle to live beneath your means. Of course, there are necessities, such as paying rent or a mortgage. However, examine other expenditures. You might want to consider adjusting or eliminating your cable and phone subscriptions. Plan ahead by purchasing clothes in the off-season. If there is a large ticket item that you must have, then plan to buy it within six months rather than right now. It is imperative that you plan for emergency savings. Take your savings and divide it by your monthly expenses, which is called the liquidity ratio. Shoot for at least a ratio of 2, though 3 is ideal. Once that is accomplished, you can now move on to more lucrative investments. Find out of your employer provides a defined-contribution retirement plan where you can make pretax contributions and your employer matches a portion of it. If so, then definitely take advantage of that. If you are relatively young, consider purchasing an IRA. Its advantage is that it is tax-deferred and is one way to limit your current tax liability. Sweat the small stuff. Have you ever done any impulse buying when visiting the mall or grocery store? If so, refrain from doing so and establish a plan where you stick to it. You might want to create an envelope system where you record budgeted amounts for certain expenditure categories, food, transportation, and entertainment. Place the budgeted amount of cash in each envelope and record each expenditure on the envelope. When funds are exhausted from the envelope, then no more money can be spent in that area. Of course, this system will require placing it in a secure place, such as a safe-deposit box. While you might be derailed today, follow these principles and tomorrow you will be back on the financial track.